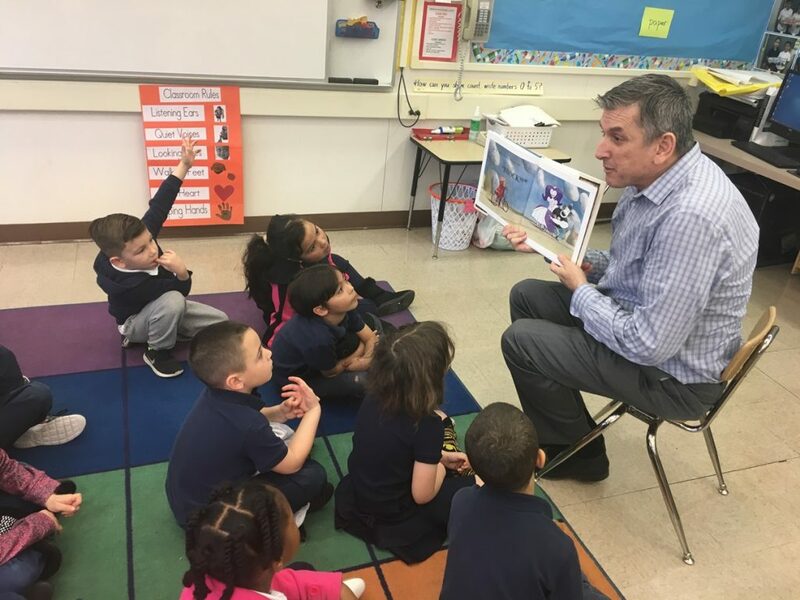 Eric Heins reads to students at Highlands Elementary in Pittsburg Unified School District in the East Bay on the March 2, 2017 “Read Across America” celebration of reading. In this new era of local control, a teacher’s role in school improvement is changing. Educator-driven school improvement works because what teachers do is an art as much as it is a science, and it is a lot more than a test score. The best teachers understand their students’ strengths and weaknesses, and adapt their practices to both. Real education improvement capitalizes on the fantastic pool of talent California has in classrooms today, and the diverse approaches we offer our students. California’s Day of the Teacher on May 10 has its roots in the community and is patterned after the celebration of the traditional “El Día del Maestro,” which is observed in Mexico and Latin America countries. Our California’s Day of the Teacher arose out of legislation cosponsored by the California Teachers Association and the Association of Mexican American Educators in 1982. Since then, as our student population has grown and become much more diverse, California has increased in prominence on the world stage, and is now home to the 6th-largest economy in the world. As teachers, we know that our diversity makes us stronger. We see it play out every day in our classrooms and on the playgrounds, and that’s why we celebrate, embrace and protect it. Teachers know what works best when it comes to improving student learning, and the simple fact is…one size doesn’t fit all. Some students need more one-on-one attention that’s only possible with smaller class sizes. Some need after-school programs, counseling and health care so they can come to school prepared, healthy and ready to learn. Some will need access to music, art and sports programs to keep them engaged with a well-rounded education. And all will need opportunities to succeed. Educators create those unique opportunities every day, yet it can be difficult when students are too worried to focus on learning. These days, many students live in fear their parents may be deported, are anxious about being bullied, and are uncertain they will be able to afford college. These are heavy topics and real problems that get in the way of learning. As educators, we want to make sure every student feels safe, supported and cared for. And we want to make sure that all students get the public education they deserve. It’s why we’ve taken a pledge to make every public school and college a safe place for all our students to learn and grow. It’s why we’ve taken a pledge to provide a well-rounded education with history, science, art, music and PE classes that build strong minds and bodies, along with the technical skills and career training that build brighter futures. California communities share our goals for quality public schools and recognize public education is the cornerstone for strong communities. Students are at the center of everything we do and as committed, caring education professionals, we cherish relationships with parents, community organizations, local businesses, other unions, the faith community and senior citizens. We are all part of a community, and our students will succeed when we work together. Teachers and educators live by a pledge – a pledge to deliver all California students the quality public education they deserve. It’s why we are active citizens, we speak up on issues that impact their learning conditions, and we engage our communities because we know that, together, we can determine the best education for the students in our neighborhood schools. We can’t do this important work alone, which is why we are asking Californians to join us in taking our pledge on behalf of all students. We need parents, community members and lawmakers to join us in advocating for students and against policies that undermine their right to attend schools free of fear, bullying and discrimination. Eric C. Heins, who taught elementary school most recently in Pittsburg, Calif., is president of the 325,000-member California Teachers Association (CTA). Our children need to have the opportunities and resources provided by after school programs to help them connect and develop into positive individuals. I feel there should be a withdrawal of CTA’s opposition to SB 78. The after school programs need the funding for resources so that our children have various opportunities. Let’s keep our children at the heart of our work! Please help save funding for the students of Los Angeles. Most of the communities depend on these programs to keep their children safe. I couldn’t agree more with this statement. People come in all shapes and sizes, and we as educators need to be aware of this. The days of a one size fits all approach is long gone. We need to cater to various learning styles because it would be ineffective to keep teaching a certain way if it’s not working. Just want to say thanks again for the illuminating article! Take care! While your intentions are good – please don’t hurt the successful functioning of current after school programs. There are real lives and futures impacted. I’d love for you to see you withdraw your opposition to SB 78. One of the important benefits of California’s focus on social and emotional learning (SEL) is an opportunity for K-12 to see afterschool and summer learning not just as “where and when” partners (the places where kids go when they’re not in school) to “what” and “how” partners. That is helping inform what children want to learn and how they want to learn. The voice of our students is present in quality expanded learning programs and we have much to learn by working together and supporting each other. Children need extra outlets like the LA’s BEST after school program. I used to be an LA’s BEST student myself and I now have the opportunity to return what I gained in LA’s BEST to children in the program today as an employee. If it wasn’t for after school programs, I would not be who I am today. Opposing SB 78 would rob thousands of children from this experience. The experience of changing a child’s life – just as mine was changed. If you wants the state to support after school, you should withdraw CTA’s opposition to SB 78, which opposes after school funding! Together we can make a difference, no child should be denied their education. They are our future doctors, lawyers, educators, president. Not only should our children not be denied an education, children should also not be denied safe, educational after-school programs. I most definitely agree that California communities share the goals for quality public schools and recognize public education is the cornerstone for strong communities. Let’s do what we must to ensure that our children receive the highest quality of public education possible. I’m in favor SB78. It will allow After School Education and Safety Program, serving more than 400,000 low-income pupils in over 4,000 high-quality elementary and middle school programs statewide, to keep the doors and gates open in our community school and give our children an added chance to succeed. I agree that kids need activities like sports, music, and arts in after school. This keeps our kids out the streets making sure they are being well provided especially our youth at risk. I am also unclear why the CTA is not supportive of this. As Barbara mentioned, it is $1 a day to support. So I want so say, Why don’t you support SB 78 to make this happen and instead of just writing a article with no meaning? If you want the state to support after school, you should withdraw CTA’s opposition to SB 78, which opposes after-school funding! In the many years I have worked with young children and their parents I have observed how teachers and after-school staff have made a difference in their lives. It is vital that each child receives the care, love and education that will lead them to productive adult lives. With parents working, it is important that children have not only an excellent school experience, it is also wise that after-school programs are available to provide their needs for help with homework and time with arts, music and good nutrition. I couldn’t agree more with Eric Heins’ statement engaging support for child centered needs being met in order to ensure success for all our students, which translates to success for all of California. I’m not sure why then CTA is not supportive of the small amount, $1 per student as I remember, to ensure that the doors of after-school programs continue to remain open to give added value to our students, schools and communities. I would urge the members of CTA who I know have every child’s reaching their potential at their heart as well as the leadership shown by Eric Heins to reconsider and come out strongly in favor of SB 78. I wholeheartedly agree that music, arts, sports and after school programs are a critical aspect of public education, especially for children whose families can’t afford to pay for private services. But why are you singing the praises of these supports in an article and at the same time actively opposing SB 78, which would increase funding for after-school programs, which have been flat-funded for over 10 years? Please inform your lobbyists of your values and instruct them to remove opposition to this critical bill. CTA is the sole opponent of the bill, which would allow high-quality after-school programs to remain open to families who rely on them. I applaud Eric Heins for recognizing the range of opportunities students need access to, in order to be engaged in their learning. He specifically mentions after school programs, which are a proven strategy for engaging students, broadening their horizons, and helping them build skills that really matter in school and beyond. However, CTA is opposing a modest budget increase for California’s after school programs, which is essential for these programs to even keep their doors open. If teachers think after school programs are important, why won’t they support a small investment to keep them in business?